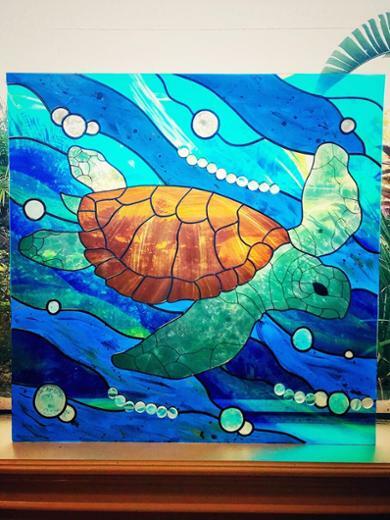 Please see a collection of my work in the home including traditional stained glass styled pieces, and more artistic vibrant glass designs. 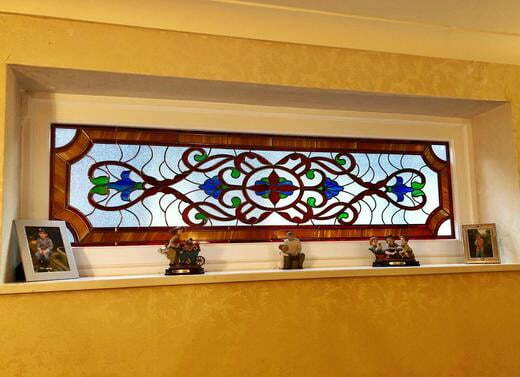 This customer wanted to re make a design she had commissioned in Stained Glass Overlay over 20 years ago! 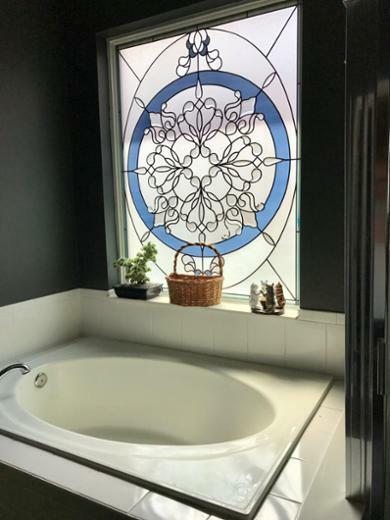 With new bubble texture privacy glass installed, and carefully picked films and lead, we were able to deliver a fresh look to this bathroom. Pebble texture privacy film and fully opaque color films block the view of the neighbors house next door, while still allowing natural light into the room. 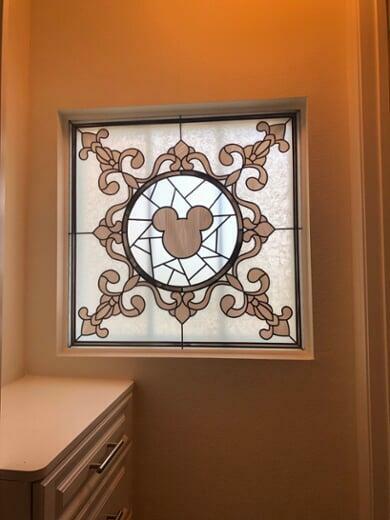 A traditional design with hints of soft blues and pinks to compliment the decor, with a little hidden Mickey for fun! Full privacy is achieved with rice paper effect background textures, and platinum lead to match the fixtures. This customer wasn&apos;t happy with the builder option for their front entryway. 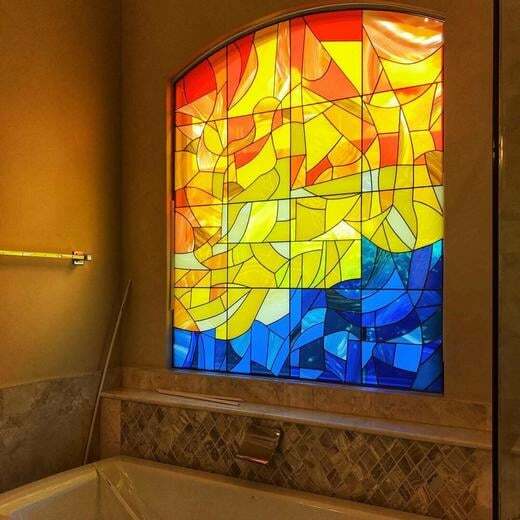 For this piece i included colors that complimented their decor, and a simple elegant design that offers complete privacy. 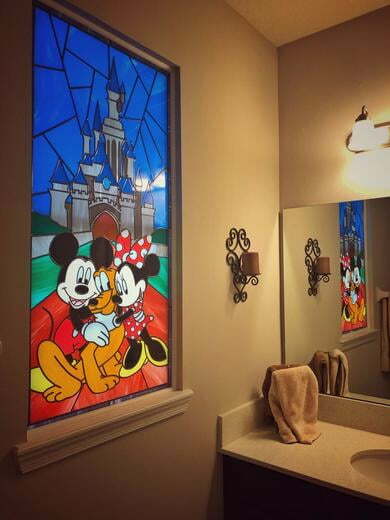 I little hidden Mickey in this traditional stained glass design. Opaque texture and soft blues to match the decor, and platinum lead to compliment the fixtures. 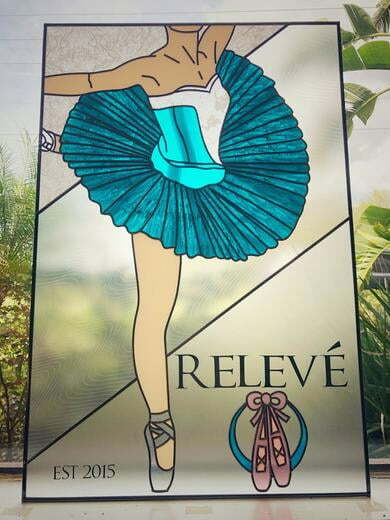 This piece was a small commission for a local dance studio. Glass paint sponged on top of mylar film mimics the look of tule in the skirt, and soft textured backgrounds help the figure to pop. 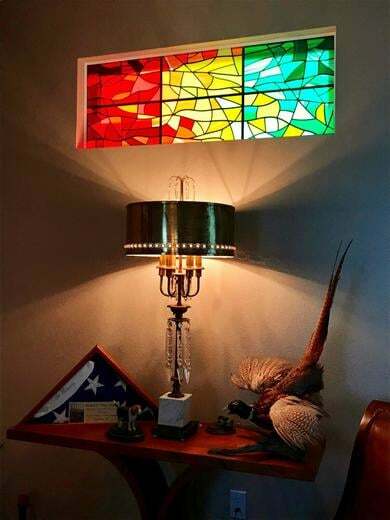 This design was inspired by the stained glass in the Segrada Familia church in Barcelona. 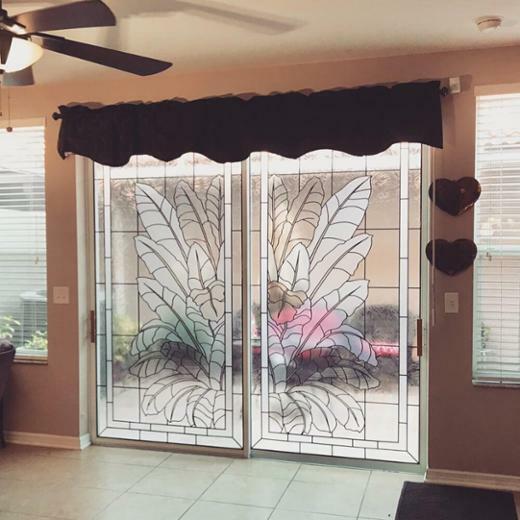 Novel approach to create privacy on sliding doors using textures and lead. 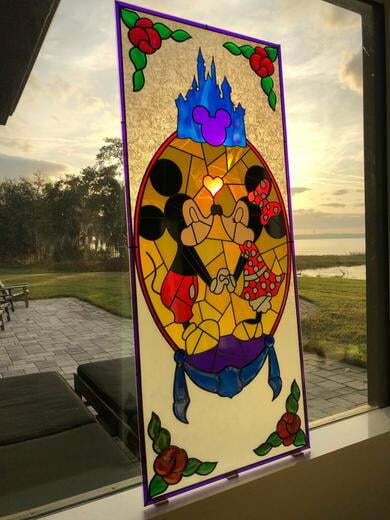 Retro style Mickey and Minnie are the spotlight in this charming piece for a staircase window. 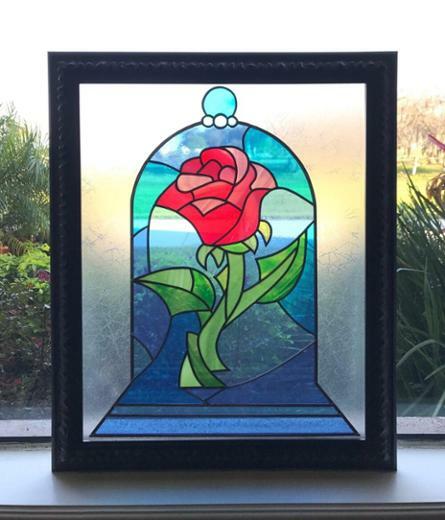 Cut glass bevelled roses in each corner and a bevelled sash along the bottom create a more textured look. These heavily bevelled living room windows are over 15ft in the air and overlooked the neighbors rooftop! 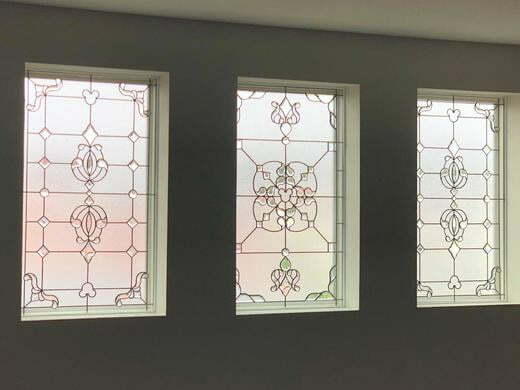 Pebble texture background obscures the view, and over 150 cut glass bevels reflect the light to create an elegant look. Classic textures and leading design on electric sliding pocket doors. 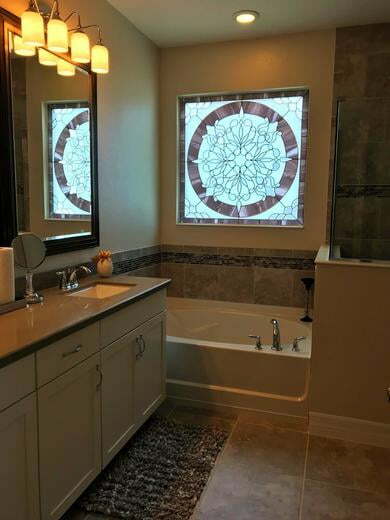 This fun design for a guest bath provides privacy, while the opaque colors still allow the natural light in. Soft greys and blacks were used in this design to compliment the rooms decor. 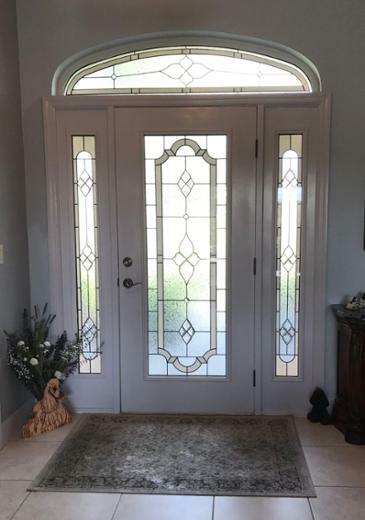 Rice paper and frost texture for privacy, installed with a white wood trim for a clean finish. 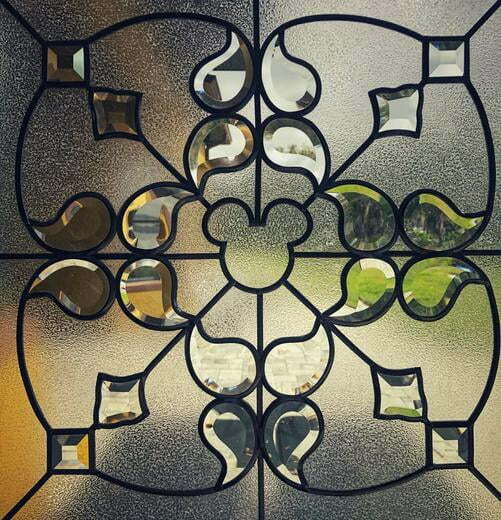 Cut glass bevels, antique lead and a little hidden Mickey in this elegant design for a living room window. 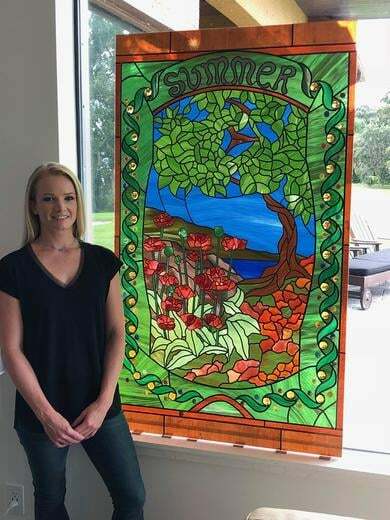 Tiffany inspired &apos;Summer&apos; design, for stair well glass. 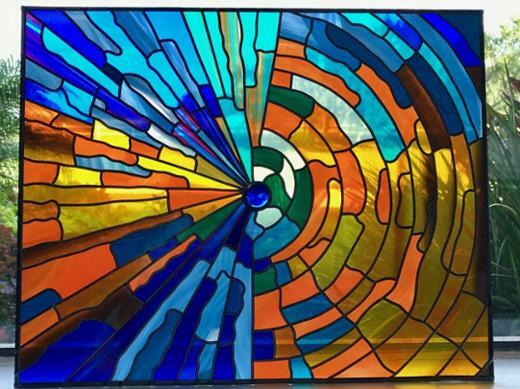 Based on a design by Tiffany I create a piece to add vibrancy, color and privacy to a stairwell. 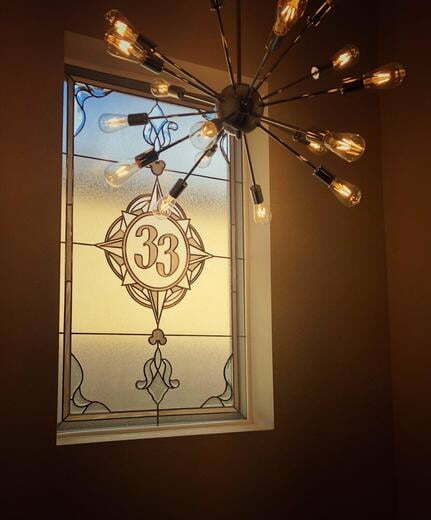 For this piece i used the Disney World Club 33 logo as the focal point in this large staircase window. 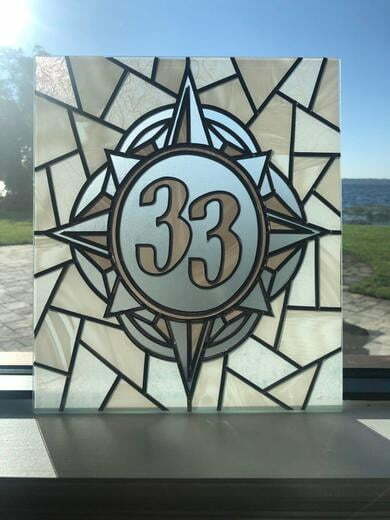 Cut glass bevels surround the compass logo, refracting light and creating a little extra sparkle for this stunning piece. 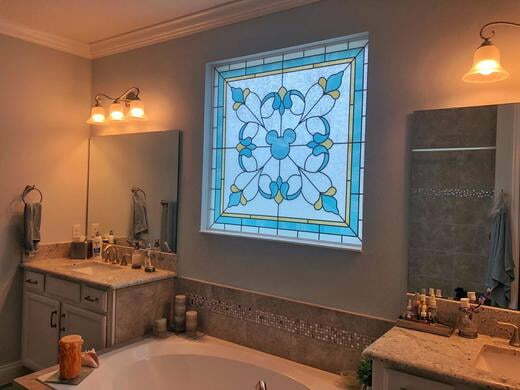 A traditional design with over 100 glass bevels create an elegant look for this bathroom window. Full privacy is achieved with rice paper texture, and platinum lead compliments the fixtures. 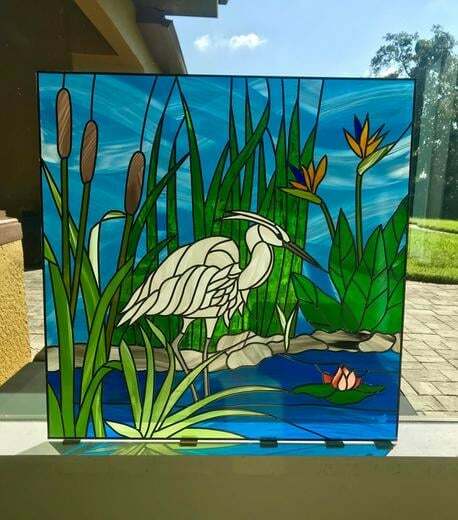 A beautiful stained glass heron design for a renovation project in Daytona. 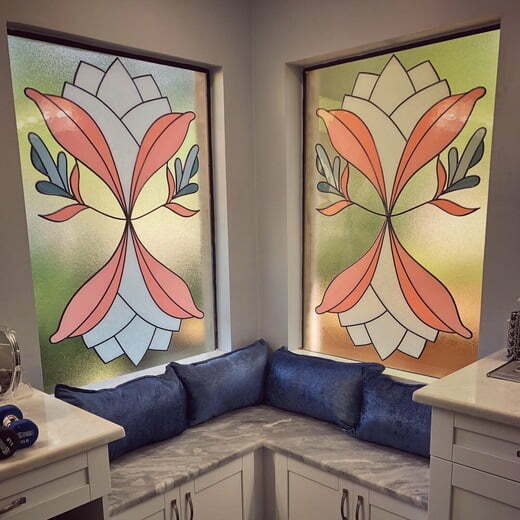 Ideal for any window requiring privacy, the piece was created using paints, colors and jewels. 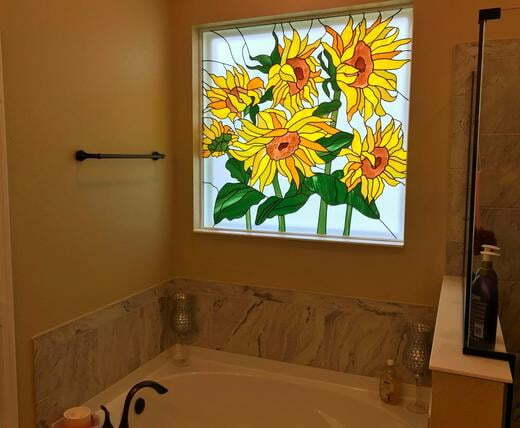 Colorful and vibrant bathroom window in a sunflower design, to add privacy and style. 13&apos; x 15" Club 33 logo is going to be framed and hung on a wall besides other Disney collectables. 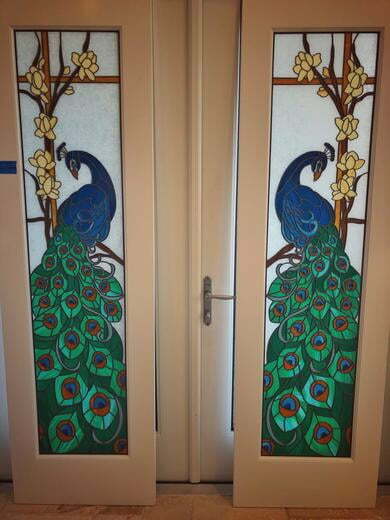 Set of panels for door glass with two sidelights in a vibrant set of colors. 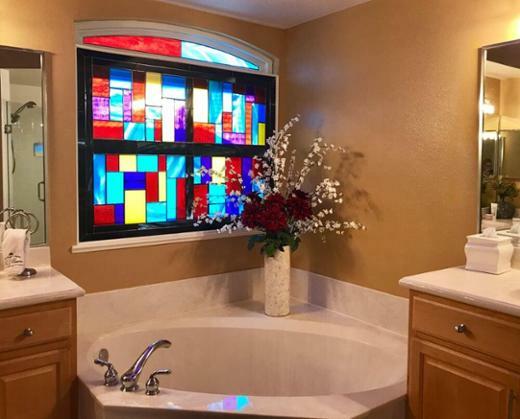 Modern design with multiple colors and black cross to hide window frame. 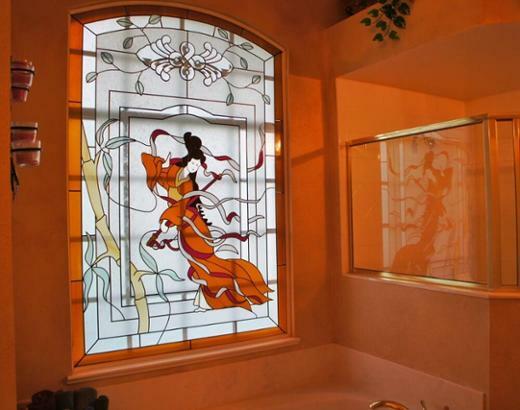 Creates privacy and style. These stunning peacocks were completed using luscious greens and shimmery blues to mimic the look of real peacock feathers. Rice paper textured background makes the birds pop, and antique lead gives it a classic look. 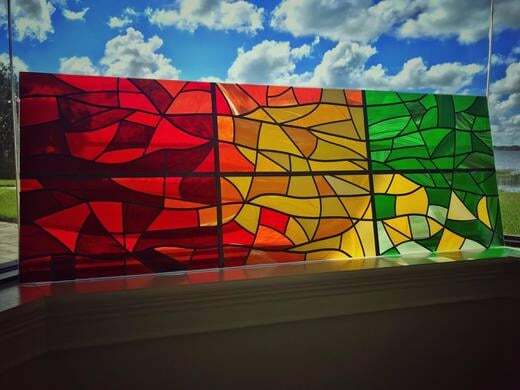 Dark reds fading into yellows and greens in this contemporary fall design for an office window. 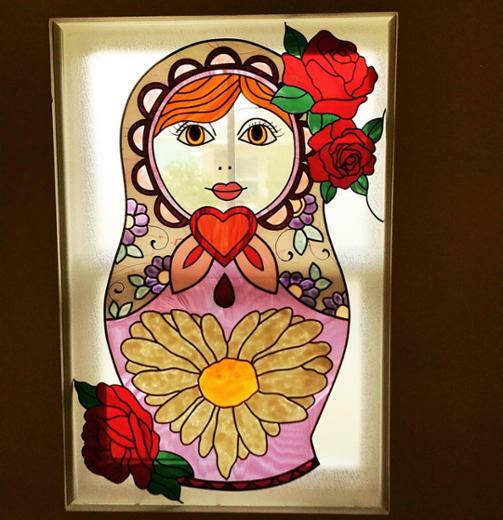 Classic Russian doll design with many colors and textures for a stunning look. 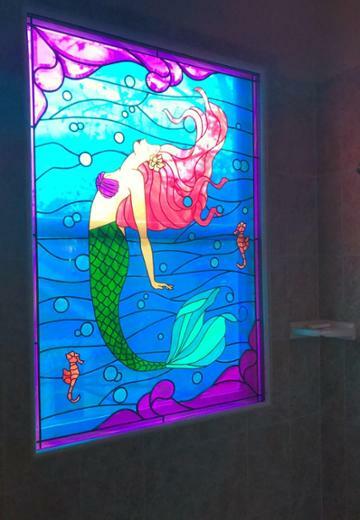 Stunning bathroom window mermaid design in vibrant pinks, purples, blues and greens. 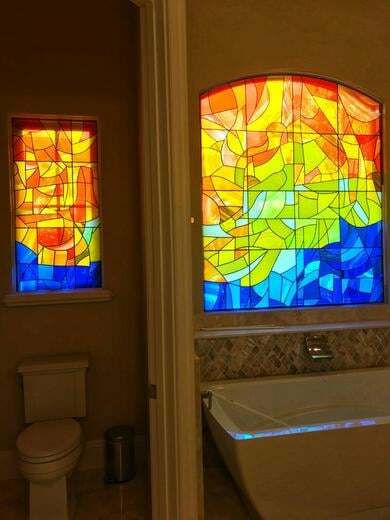 Full view of sunrise over water design for high end bathroom. 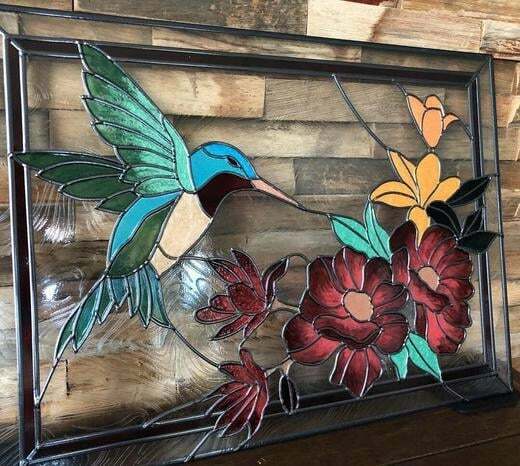 Hand painted flowers and hummingbird on this delicate decorative glass shower window. 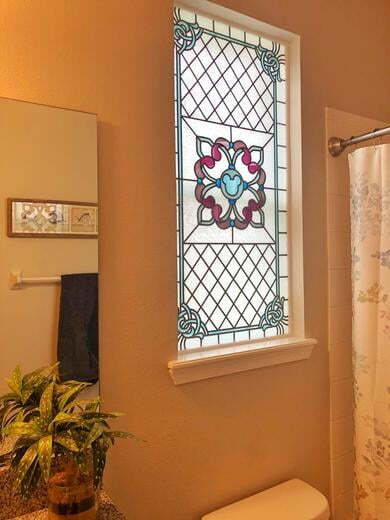 Classic rose design window using complementary bevels and textures to add bathroom privacy. 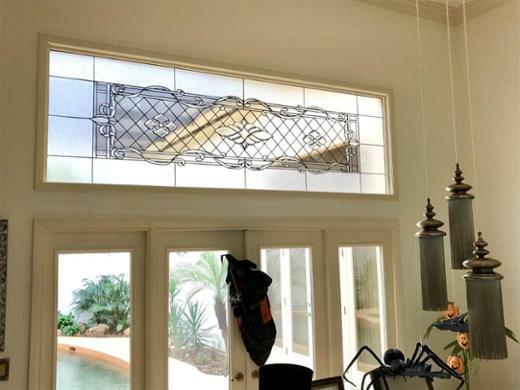 Textured glass & diamond shaped bevels to add privacy to this transom and sidelight set. Detailed sand crane scene using a large variety of textures and colors. 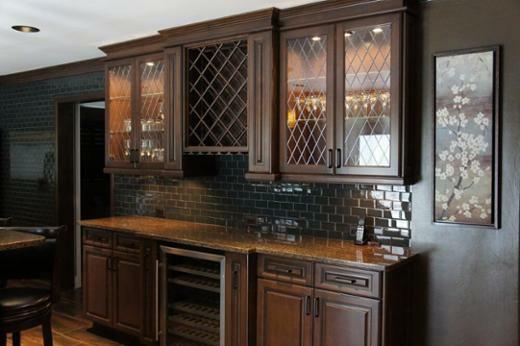 Cabinet glass in leaded diamond formation to compliment display cabinets in upscale kitchen. 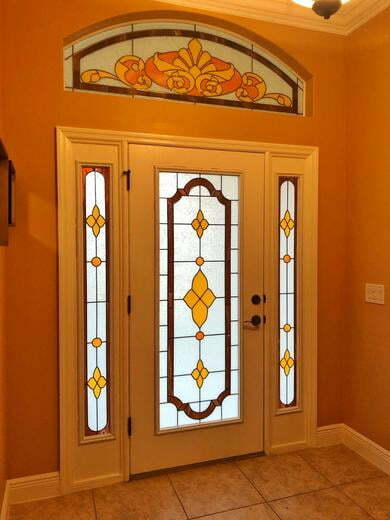 Large transom, replaced with glass in texture and color, complemented with matching sidelights. 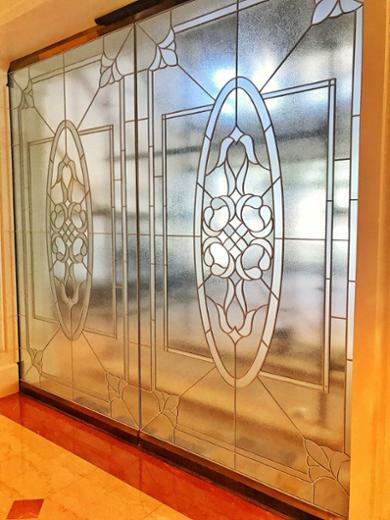 Bevelled, textured and colored design for a set of entry way glass panels. 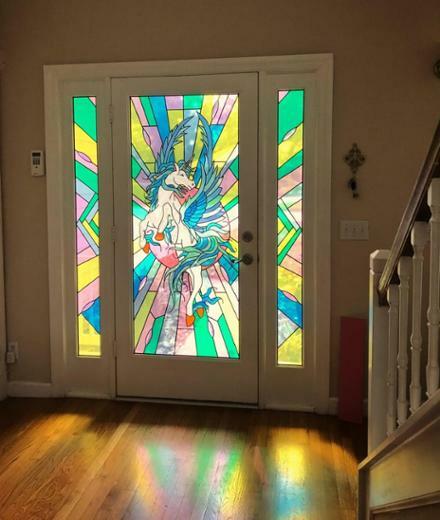 Japanese style Geisha window with colors, textures and bevels. 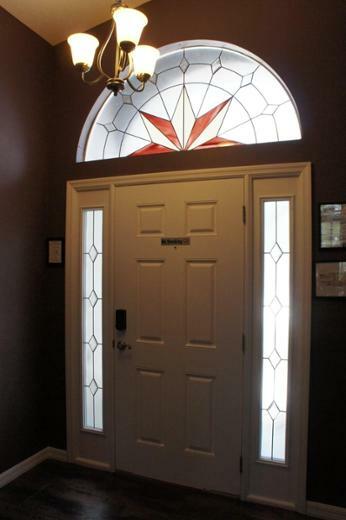 Oversized transom design using a set of textures and bevels to compliment and upscale room. Scene of a 18th century lady reading a book. 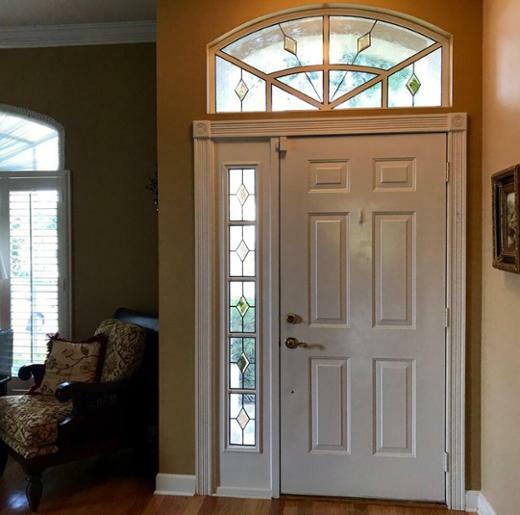 Created for a customer with two windows requiring continuity between both. This item is for sale, please contact me for details. I&apos;m selling this sample piece, please contact me for details. This piece is currently available. Please get in touch for details. I&apos;m currently selling this piece, please get in touch if interested. Art Deco Cat in Reds and Pinks. 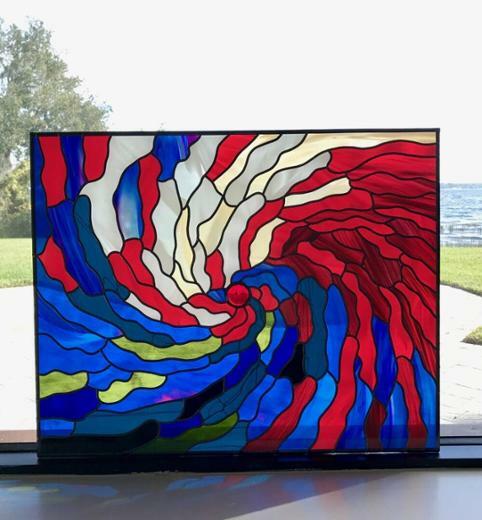 Another great sample piece for sale, please contact me for details.